Below is the FY2018 budget. FY2019 is currently in development and on the Town's Budget Portal. 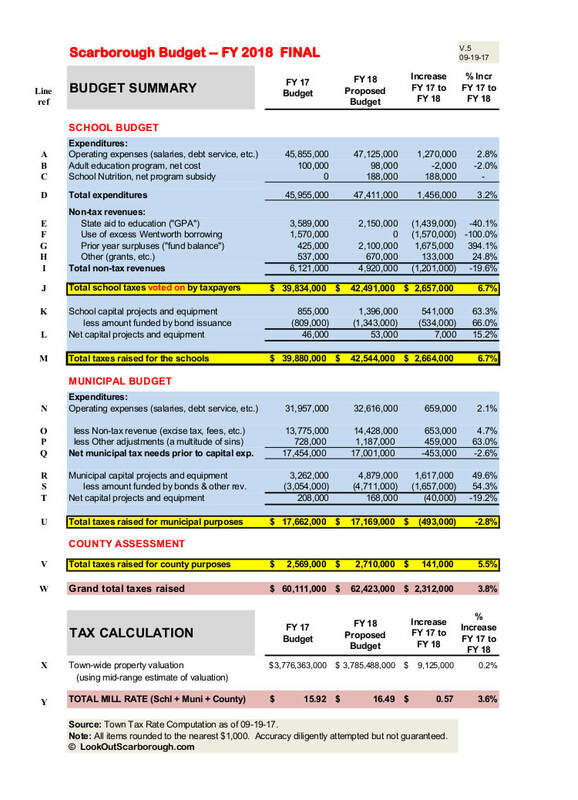 The FY2018 town budget is 394 pages and can be found on the town website. As most humans find that document to be a bit overwhelming, below please view this Budget-in-a-Nutshell approach allowing an easier inspection of the budget. Please take note of lines K and R showing the amount of capital expense for the school and the municipal. These two lines total over $6 million in the FY2018 budget. Debt is typically used to cover capital expenses. On the home page is a general obligation debt chart showing the town's history of not paying down debt levels resulting from large projects.